The big surprise with the NDP's breakthrough is Alberta is seen as the country's most conservative province. Home of the oil sands, Stephen Harper, and the Wildrose party, there's plenty of evidence to back this up. But, Calgary and Edmonton both have progressive mayors, Alberta is the youngest province demographically, and Albertans are feeling the economic (not to mention environmental) downside to an oil dependent economy. Rachel Notley reminded everyone that Alberta is defined by... Alberta. It happened. It wasn't a dream, or wonky polling. No one jinxed it. 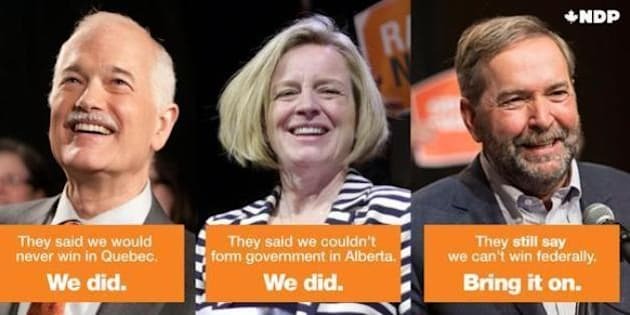 Alberta has a majority NDP government. Helping get out the vote in Edmonton Centre, I could feel the shift on the ground when property managers happily opened up their buildings so I could knock on doors, and voters came up to me, unprompted, proudly declaring "I voted NDP." Voter pride was trumping voter apathy. Tuesday night's victory party in Edmonton was one giant group hug, except every time former premier Jim Prentice appeared on the big screens. The crowd couldn't help but chant "na na na na, na na na na, hey hey hey, good bye." The big surprise with the NDP's breakthrough is Alberta is seen as the country's most conservative province. Home of the oil sands, Stephen Harper, and the Wildrose party, there's plenty of evidence to back this up. But, Calgary and Edmonton both have progressive mayors, Alberta is the youngest province demographically, and Albertans are feeling the economic (not to mention environmental) downside to an oil dependent economy. Rachel Notley reminded everyone that Alberta is defined by... Alberta. "Jim Prentice said Alberta is not an NDP province. He's right because Alberta doesn't belong to any political party. Alberta is not a PC province. It's not a Wildrose province. Alberta belongs to Albertans. And Albertans -- Albertans! -- are going to decide who the government is." Albertans did exactly that, reminding the country that enough is enough -- the policies that got the province into this economic mess are not working and party loyalties will shift because of it. Why exactly was this election called? In what became a ballot question, Prentice's early election set his campaign off on the wrong foot. Voters felt Prentice was putting the PC party ahead of their interests, spending almost $30 million on an election that the province doesn't have. Each election, politicians apply for the job to represent the public. Insulting a voter, is like insulting the person hiring you. When asked about the province's budget shortfall, Prentice told CBC Radio that Albertans need to look in the mirror. "In terms of who is responsible, we all need only look in the mirror, right. Basically all of us have had the best of everything and have not had to pay for what it costs," Prentice said. Notley addressed how condescending these remarks were, calling them "profoundly insulting." Throughout the campaign, Notley recognized the realities most Albertans are facing, trying to make ends meet. As Prentice attempted to mansplain tax rates during the leaders debate, he offended Notley and voters everywhere with the snide remark "math is difficult." Maybe math is difficult for the former ruling party, who voters feel failed to manage their money, leaving them empty handed in a recession. Pundits love saying this every campaign: campaigns matter. It's worth repeating, because an NDP government wasn't on anyone's radar (including the Alberta NDP) just four weeks ago. In a poll-obsessed political culture, often we (media, parties, voters) go into elections with a rough idea of the outcome. But it is during campaigns when most voters tune in to watch the candidates in action, and see what their vision is for the future. Notley's stellar performance during the leaders' debate made headlines, trended on social, and even won praise from conservatives. Her debate skills, command of policy, and natural likability left viewers thinking: one of these things is not like the others. Despite fiscal mismanagement, and voters turning their backs on both conservative parties in endless polls, incumbent Premier Jim Prentice and the PCs were endorsed by the four largest papers in Alberta: the Edmonton Journal, Edmonton Sun, Calgary Herald, and Calgary Sun. It has since come out that it was the newspapers' Toronto-based ownership, Postmedia, that made the endorsement and directed that it be run. This was following a group of CEOs in Edmonton endorsing the PCs while threatening "we won't make donations to charities" if an NDP government was elected. Perhaps this was the look in the mirror moment of the campaign. This is all set to change, as Albertans were tired of the poor provincial leadership that got the province into its dire financial situation. The NDP campaigned on raising the corporate tax rate to 12 per cent (same as Saskatchewan and Manitoba, Ontario at 11.5 per cent), and a progressive tax system that increases income tax rates for the top 10 per cent of earners. Notley's big win has been compared to Jack Layton's federal NDP breakthrough four years ago this May. Both campaigns had charismatic leaders who showed voters that politics can be better, contrasting hope with the Conservative's fear. Notley's campaign attracted the diverse support of people who believe investing in education, health care, and the environment is not only the smart thing to do, it's the right thing to do. As Notley said so succinctly, "families are better off when all our families are better off." Nötley Crüe knock off T-shirts soon became official campaign merch, making politics fun, if not cool for a moment. Like any true leader, Notley's success is bringing out leadership in others, creating a larger movement that people can own. And this victory, truly belongs to Albertans. Jennifer Hollett is the federal NDP candidate in the new downtown Toronto riding of University-Rosedale.